England all-rounder Sam Curran was snapped up by Kings XI Punjab for $1,000,000 in the IPL auction in Jaipur. 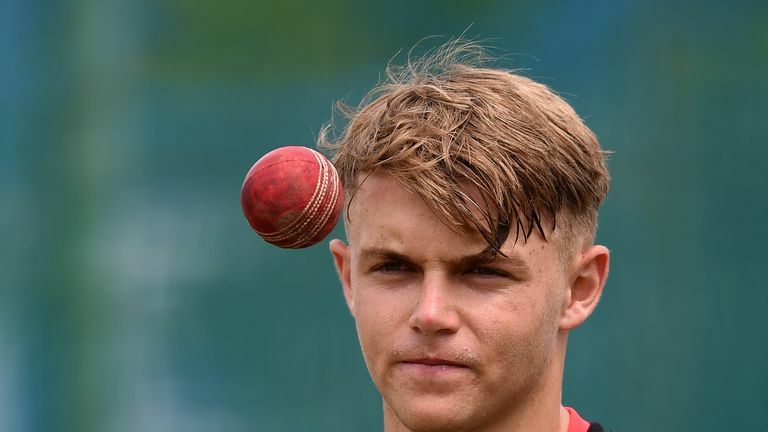 Sam Curran has been signed by Kings XI Punjab for $1,000,000 in the IPL auction, with Jonny Bairstow joining Sunrisers Hyderabad. Curran has linked up with Kings XI, who also have Windies star Chris Gayle on their books, for around £788,000 after the franchise saw off competition from Virat Kohli's Royal Challengers Bangalore. The 20-year-old all-rounder has won each of his seven Tests for England to date, playing a number of vital knocks down the order, including hitting three half-centuries, as well as taking 14 wickets with his left-arm seam. But he remains on the fringes of the England ODI team - he has played just two ODIs so far - and is an outsider to make his country's World Cup squad so could feature in the whole of the 2019 IP which starts in late March. Bairstow has been picked up by Sunrisers for £240,000 after a prolific year in limited-overs cricket, hitting four one-day international centuries, with only Virat Kohli and Rohit Sharma scoring more ODI runs than his 1,025. Sunrisers and Kings XI Punjab entered into a bidding war for Bairstow, who will only be available to play in next year's tournament until April 25 before being required to report for England duty ahead of the World Cup. Kent and England all-rounder Joe Denly was snared by Kolkata Knight Riders for £110,000 and will be joined at the franchise by Nottinghamshire bowler Harry Gurney who was recruited for £84,000, while Lancashire's Liam Livingstone is off to Rajasthan Royals in £56,000 deal. Alex Hales, Chris Woakes, Chris Jordan, Laurie Evans, Lewis Gregory, Jamie Overton and Pat Brown all went unsold, while Tymal Mills, Eoin Morgan, Samit Patel, Mark Wood, Steven Finn, Luke Wright and Liam Dawson were not involved in the auction at all despite putting their names forward. Indian seamer Jaydev Unadkat re-joined Rajasthan Royals for 840 lakh (£919,000), with Kings XI shelling out the same fee to capture 27-year-old mystery spinner Varun Chakaravarthy in the biggest deals of the day. Other big-price acquisitions included Colin Ingram heading to Delhi Capitals for 640 lakh (£700,000) and Carlos Brathwaite, Axar Patel, Shivam Dube and Mohit Sharma joining Kolkata, Delhi, RCB and Chennai Super Kings respectively for 500 lakh (£547,000). New Zealand's Martin Guptill (Sunrisers Hyderabad) and former Indian all-rounder Yuvraj Singh (Mumbai Indians) both clinched late deals after missing out in the first round of bidding.